All those who have hit the big 30 may start to feel anxious about losing their beauty. Don’t fret, you’re not alone! Aging is the natural and normal process that everyone goes through. But sometimes, complicated feelings may arise as we watch our bodies change with age. Suddenly, wrinkles are appearing where once it was firm, taut and smooth skin. Overtime, the skin loosens and just as teenagers may grow into panicky frenzy over changes in their growing bodies, so do middle-agers. It may be an uncomfortable process, and not everyone is ready to let nature take its course just yet. So growing into your 30’s or 40’s, many want to look their best in both their love lives and careers. However, in this day and age, hitting the big age of thirty is the new twenty where there is the option to reinvent yourself at midlife; some adults do age well, while others who do not, are taking action to preserve their youthful appearances through surgical means. DOES COSMETIC SURGERY SEND A NEGATIVE MESSAGE ABOUT AGING? But if aging is a natural process, shouldn’t it be left alone to run its course? Many common complaints and disapproval voiced against cosmetic surgery may run along these lines: Getting cosmetic surgery may seem to be an act of defiance against nature and is just a foolish pursuit. But does it really send a negative message about aging? Does it really make people preoccupied with the inevitable, is it a waste of time and an obsession? This is probably a one in a million kind of incident to happen, but lately there has been news of a burglar who got away from his misdeeds through a rather peculiar method: Korean plastic surgery. You’d think that only hip and competitive youngsters would opt for surgery in today’s image-conscious Asia, but no! There are burglars who have decided to advance their careers, too! They, too, also desire to perfect their craft! The art of burglary now goes hand In hand with plastic surgery. 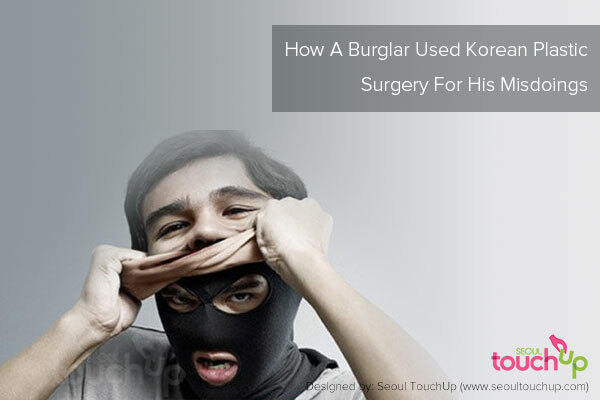 Reported by the Korea Herald, this burglar fellow claimed to have gotten surgery because he wanted to feel better about his shortness. So what did he do? Robbed people! A total of 87 incidents during April and December of last year. For most people, jawline surgery or osteogenesis (making bones lengthier) would cost an arm and a leg. Oh, but not this guy because he had all the money in the world to get those surgeries done. From his robberies, he had gained a total of $480,000 worth of goods. If we look at this lovely chart that shows the average cost of Korean plastic surgery, this guy could’ve done jawline surgery for ninety-six times if he so felt like it! Korea is always very quick to pick up the latest plastic surgery trends and to offer its patients the highest surgery quality possible. The Vampire face lift is the newest plastic surgery trend for anti-aging procedures. Although this is a procedure that you can find in other parts of the world as well, it is no surprise that Korea has found a way to make it extra special, and to cater it specifically to patients coming from Asian countries. The Vampire face lift is the newest anti aging surgery, and it is also one of the most natural ways to do it! First, a small amount of blood will be drawn from your arm, and that blood will then be placed in a Selphyl machine. It spins the blood at a very high speed, which separates the platelets, which are then injected at various points of your face. These platelets help start new collagen productions within your skin, which makes it look more plump and younger, and has also proven to be a great way to fill out wrinkles for a longer period of time. It is not a permanent procedure, but many patients reported that they could go a full year before thinking that they may need to do it again. The great thing about the Vampire face lift is that it does not involve any incisions, and once the collagen runs out, your face returns to its original look, which is great for people who do not want to make a drastic and permanent change to their features. Also, because this is not a complex procedure, there is no recovery time. The patient simply leaves the clinic as soon as they are done, and then their own skin does the rest of the work in the next few days by producing more collagen. Getting ready for plastic surgery isn't just about being mentally prepared for the procedure, but also about being prepared in terms of all the things you might need on your trip. When you are undergoing any procedure, having to go out to buy something, or to send someone on an emergency errand, can really ruin your mental state and should be avoided at all costs. Korea is a wonderful place to go to, especially when it comes to the experts in plastic surgery, and although it has everything that you could possibly imagine for surgeries, it is always a good idea to have your own things ready. Depending on what time of year you decide to arrive to Korea, you will need to prepare yourself accordingly, because Korea is a country with a climate that varies from being very cold to being exceptionally humid at times. Although you can have a plastic surgery done in Korea at any point during the year, it is often advised that patients come during the colder times of the year because incisions heal a lot better when the weather is colder, since it narrows the blood vessels and reduces blood flow. If you do come at this time of year, your essentials for Korea plastic surgery travel must include a variety of warm clothes, as well as an umbrella, because it does rain fairly often. The Korean winter is very chilly and you will often see people wearing masks to protect themselves from catching a cold, as well as to prevent cold air from entering directly into their throat. Masks are very popular in Korea and you will see many people wearing them on a daily basis, so it is a good idea to bring a pack with you, or to buy one as soon as you land. One of the first things that you’ll probably need to do is to organize the free days that you will need with your boss, especially if you have decided to actually go to Korea to have your surgery done. If your boss does happen to be a very kind and understanding person then you might wish to tell him the precise reasons why you will need to leave work. However, if you know that they will become judgmental or deny you your free leave because they don’t think that plastic surgery is a good enough reason, there is no need to tell them the whole truth. You could easily just mention that you will need to undergo a procedure to improve your health and leave it at that. Getting plastic surgery done is no small thing, and you need to do everything you can to stay positive and ensure that you have as much support as possible from your environment. If you leave for Korea knowing that your boss is angry at you, it will be one more item of pressure that you will constantly be thinking about. The same is true for your colleagues. You should only mention your surgery to those who will be supportive or who also happen to be very close friends of yours. Otherwise keep away from the details and just say that you will be leaving for a few days for health reasons. It will be a lot easier to deal everyone when you come back than before you leave.